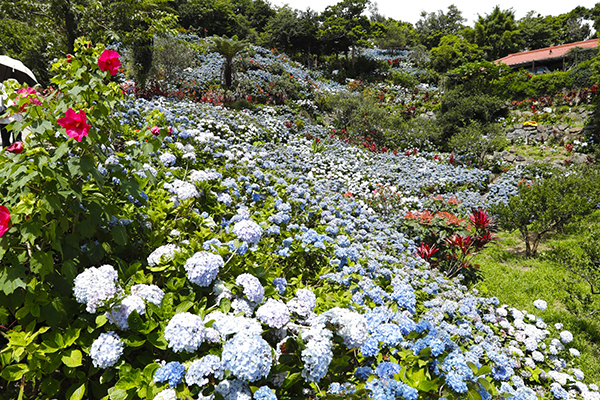 Everything on Okinawa Island from A to Z | Just like a carpet of blue hydrangeas Hydrangea Garden Yohena has opened again this year and will remain open until the end of June. Just like a carpet of blue hydrangeas Hydrangea Garden Yohena has opened again this year and will remain open until the end of June. The garden has a nicely built promenade. 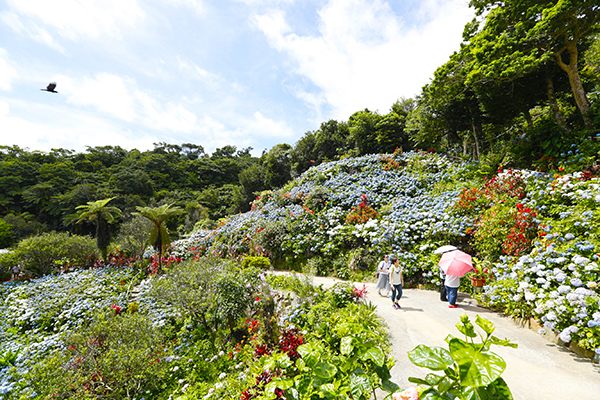 Located in the hilly area of Motobu Town, Hydrangea Garden Yohena attracts attention every year during Okinawa’s rainy season. About 300,000 hydrangea flowers blooming on 10,000 bushes fill a hillside of about 10,000 square meters. The overwhelming beauty of the garden, completely covered by blue hydrangeas in full bloom, gives people a sense of happiness. The hydrangea garden started when centenarian Uto Yohena planted two hydrangeas as a hobby about 40 years ago. Uto-san, who had been in good health until recently, has always welcomed visitors with a big smile and, along with the hydrangeas, has attracted visitors to the garden. Most of the hydrangeas at Hydrangea Garden Yohena are blue due to the acidic soil, but the soil in some parts of the garden has been made alkaline to produce pink hydrangeas. Grandma Uto wants to please the people who visit every year, and her hospitality never runs out. The mild climate, simple meals containing lots vegetables and seaweed and a living environment that encourages physical activities such as farming, based on the concept of remaining active throughout life… Uto Yohena’s lifestyle, which is consistent with all the factors for longevity, is extremely simple, and at the same time filled with what makes her life worth living, i.e., growing more hydrangeas and taking care of her garden. Uto-san, who has led a healthy life, never experiencing any serious illness and hardly ever being hospitalized until she turned 100 years old, has been blessed with nine children and heads a large family currently consisting of 102 members including great-great-grandchildren. Her husband, who was three years her senior, passed away at the age of 59, and ever since then she has led a very busy life raising her children on her own. However, when parenting became slightly less busy around the time she turned 60, Uto-san, who had always liked gardening, began planting hydrangeas in the spacious premises of her home, which used to be a tangerine orchard. Every year she raised hydrangea cuttings in pots and transplanted them into the soil. Through such steady efforts, the hydrangea garden grew larger little by little. Initially, the garden was open to the public free of charge, but through word of mouth, the garden became widely known and the number of visitors increased more than expected. Around the time that her children had reached the age of retirement, the whole family began managing and taking care of the garden, and the current Hydrangea Garden Yohena opened for business 17 years ago. Now, nearly 20,000 visitors, both Japanese and foreign, come every year to see the beautiful flowers. In 2017, Uto-san celebrated her 100th birthday, but in May of this year she was hospitalized with pneumonia. Fortunately, it didn’t become more serious, and we photographed her when she was able to temporarily leave the hospital, around the time that the hydrangeas were in full bloom. Uto-san, who loves to eat pork, confessed to us that she disliked the meals at the hospital and that she thought the finger exercises intended to prevent dementia were kids’ stuff that was meaningless. She clearly stated that she wanted to go home soon and take care of the hydrangeas. Upon becoming a centenarian, working in the field became difficult for her, but she keeps giving instructions to her children who manage the grounds so that everything is in order and visitors will enjoy her hydrangea garden. Uto-san, who says she still dreams about working in the field every day, has an amazing passion for her garden which teaches us the value of a life that is worth living. She does not follow a special diet; she simply works hard at what she likes to do. Now, this could be the secret of longevity. Born in 1917, currently 100 years old. With an outgoing personality, she has always been able to become friends with anyone very quickly. She is a super centenarian who has had an outgoing personality since long ago. Uto Yohena, who started out with only two hydrangea plants and expanded the garden to where more than 10,000 hydrangea plants are now growing, passed away on April 11, 2018 due to natural causes. She was 100 years old. May her soul rest in peace.